Cupcake Polish has a BIG launch on 2/5 and we want to spread the news! We are launching a new core collection - the Gemstones collection AND a new LE Just Peachy trio! Cupcake Polish announces its newest collection themed after one of our favorite things to collect and study – gemstones! The Gemstone Collection by Cupcake Polish is a 6-piece collection of gorgeous full-coverage holographic glitter polishes. Every polish in this collection is packed with super sparkly holographic micro glitters. These vampy colors are super wearable and perfect for those long winter days when you just need a bit of sparkle! Each polish is carefully handcrafted to resemble some of our favorite gemstones- Emerald, Amethyst, Garnet, Onyx, Blue Tourmaline, and Sapphire. All polishes in the Gemstone collection are opaque in 2-3 coats. Cupcake Polishes are handmade, long-wearing, full coverage, and 5-free. This collection launches on February 5th at 8pm CST. 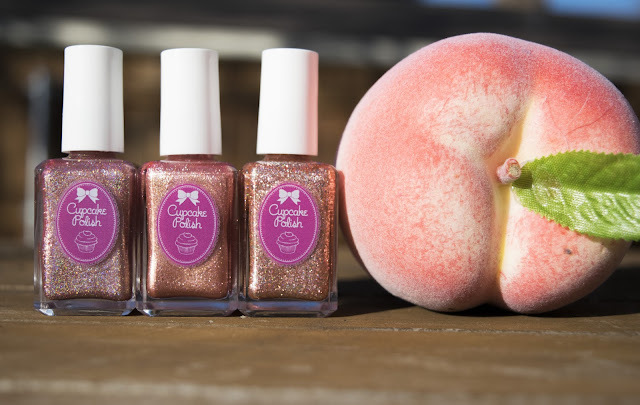 Cupcake Polish announces a fun new trio themed around a southern favorite and one of my favorite fruits- the peach!! This trio features three gorgeous polishes that are full of fun but can definitely be dressed up for those who love a little glam. All polishes in this trio are opaque in 2-3 coats. In addition to these three limited edition polishes, we are introducing a matching wax melt of the month from Ginger Fizz Boutique to go along with this trio! 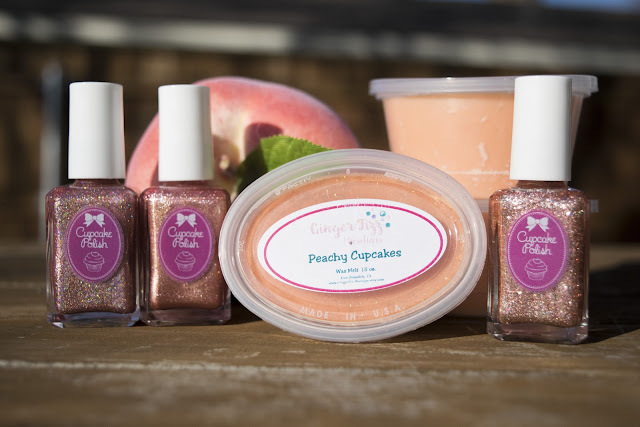 This month’s wax melt is a fun peach scent to give you smell-o-vision for these gorgeous peach polishes! These polishes and the wax melt for this month are VERY limited in quantities! Ginger Fizz Boutique wax melts are highly fragranced in a soy wax blend and are approximately 1.5oz. Polishes will be sold separately or as a set with the matching wax melt for a discounted price of $35. This collection launches on February 5th at 8pm CST.